I watch seaplanes take off and land on Lake Union all the time, but this week I stumbled upon dozens parked among cars at Kenmore Air Harbor. 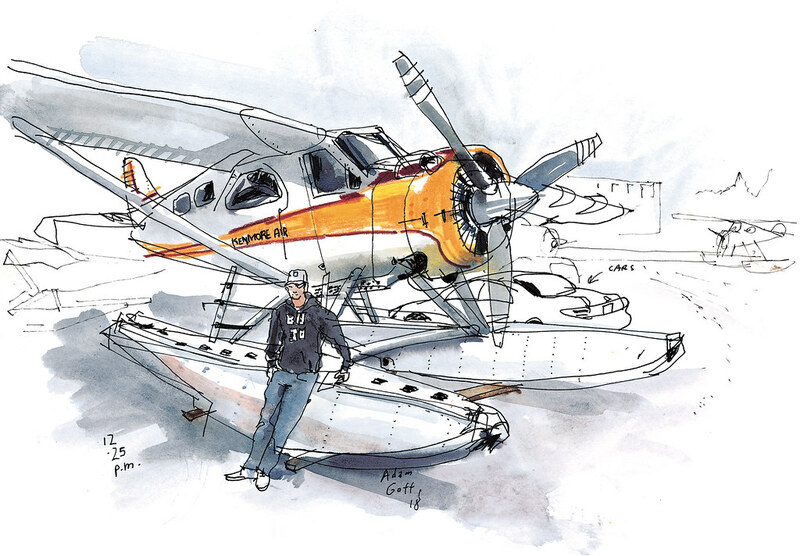 Activity at the seaplane hub on the north shore of Lake Washington is starting to pick up for the summer, said Kenmore Air chairman Gregg Munro, whose father started the business in 1946. The airline, known for its service to the San Juan Islands and British Columbia, is the largest seaplane operator in the U.S. It also attracts licensed pilots from around the country seeking their seaplane certification. I found Adam Goff, who was about to take a training flight to Lake Sammamish, studying in the parking lot as forklifts took aircraft to and from the water. He had flown up from San Diego to take the six-hour instruction course. Flying a plane isn’t on my bucket list, but I could spend hours at the benches and tables on the harbor soaking up this scene. Adam Goff, 18, plans to spend the summer flying floatplanes in Canada with his dad, who also got his seaplane rating at Kenmore Air. The rating, Goff explained, is a special permit pilots need to operate floatplanes. It proves that you know how to land and take off from water, he said. 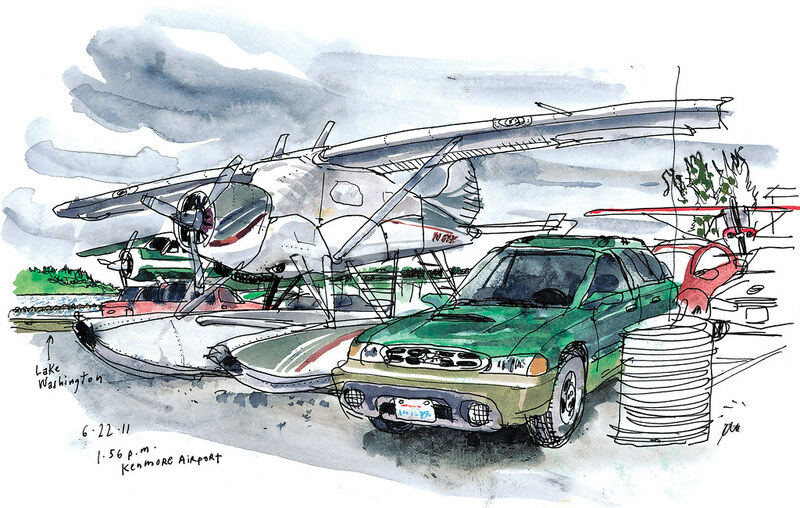 I sketched Goff in front of a Beaver seaplane, which he referred to as the SUV of floatplanes. It can carry up to six passengers. Harvey was also impressed with the friendliness of the staff at the harbor, and with the number of seaplanes. 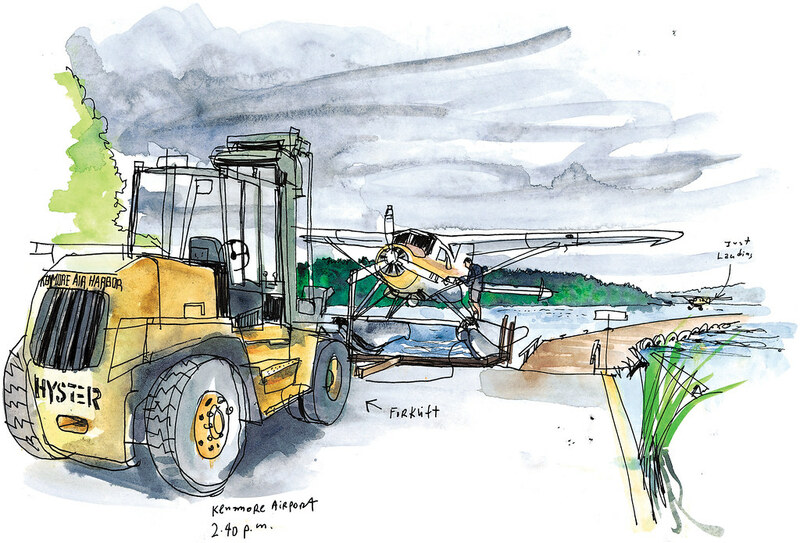 “I don’t think there are many places in the world where you can see so many floatplanes,” he said. 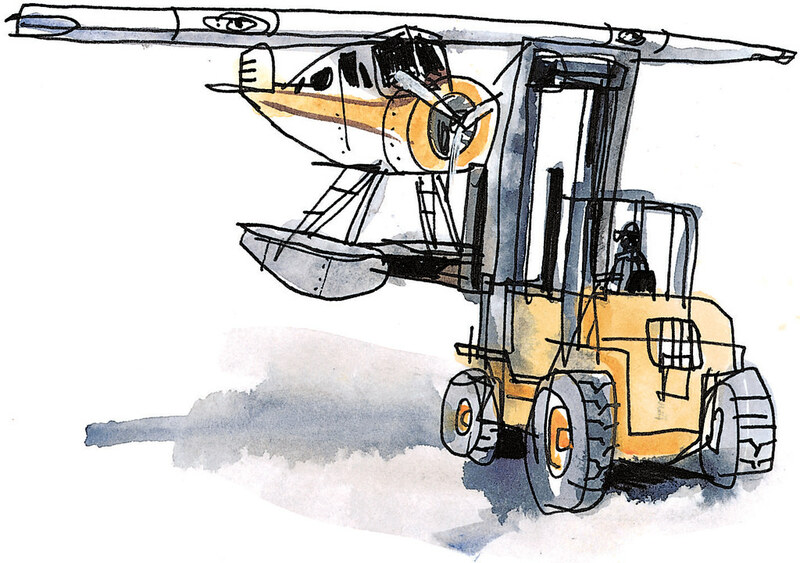 Kenmore Air personnel service the floatplanes as soon as they land, then a forklift takes the aircraft from the docks to the parking lot. The lot is also used by about 35 private floatplane owners. Ty Edwards, Kenmore Air director of customer service, said the owners call them when they are ready to fly and airline personnel put their aircraft on the water for them. Coming up: Once a month, I explore Seattle-area communities following readers’ recommendations. Where should I go? Send me your suggestions via e-mail, Facebook or Twitter. Have a great weekend!